Assam Rifles Technical and Tradesmen Exam Syllabus 2019 2020 | Assam Rifles Electrician, Blacksmith, Plumber, Nursing Assistant, Laboratory Assistant, Female Safari, Cook, Barber Syllabus and Exam Pattern are given on this page. 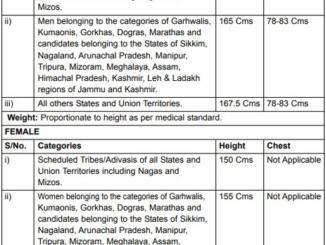 So, candidates who are searching for the Assam Rifles Syllabus 2019 they can collect full PDF on this page. Assam Rifles Technical and Tradesmen Syllabus plays a prominent role in any exam preparation. Without having Assam Rifles Technical and Tradesmen syllabus and Exam pattern nobody can know which subjects to prepare for the examination. You can check all details of Madras High Court Syllabus here. Are you looking for the free download? Then go through this section. PST / PET will be conducted at following centres. The same will be mentioned in the system generated Calling Letters, to be downloaded by the candidates themselves after successful submission of the on line application. 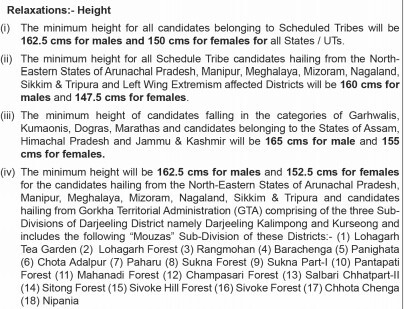 Option for choosing a centre is not available:- (a) Diphu (Assam), Karbianglong (Assam) (b) Lokra (Assam), Tezpur, Sonitpur (Assam) (c) 3rd Mile, Dimapur (Nagaland) (d) Jorhat, NEFA Gate (Assam) (e) Silchar, Masimpur (Assam) (f) Laitkor, Shillong (Meghalaya). Candidates seeking reservation benefits as Scheduled Castes / Scheduled Tribes / Other Backward Classes must ensure that they are in possession of the certificates in proper format prescribed by the appropriate civil authority in support of their claim at the time of reporting for Physical Standard Test (PST) / and Physical Efficiency Test (PET). Physical Standard Test (PST) for all trade except Clk & PA.
PET will be conducted for all the candidates qualified in initial verification of the documents. The parameters for PET are follows: 8 – (a) All India except Ladakh Region (i) For Male Candidates – 05 km run to qualify · within 24 minutes. (ii) For Female Candidates – 1.6 km run to qualify within 8.30 minutes. (b) Ladakh Region (i) For Male Candidates – 1.6 Km run to qualify within 6.30 minutes. (ii) For Female Candidates – 800 meter run to qualify within 4.00 minutes. (c) Pregnancy at the time of PET will be considered a disqualification and pregnant female candidates shall be rejected at this stage. An undertaking of not being pregnant will be taken from all female candidates before PET. (d) No Physical Efficiency Test will be held for Ex-servicemen. However, Ex-servicemen will be required to pass the requisite Medical Examination and their physical standard will 9. Trade – Armourer (For Male candidates only), Initial Rank – Rifleman, Education be measured and recorded in the documents. Written Test: The question paper of written test will comprise of 100 marks. Minimum pass marks for General Category I Ex-servicemen is 35% and 33% marks for SC I ST I OBC candidates. However the final selection will depend on the position of the candidates in the merit list in accordance to the availability of vacancies against the particular State/ Category/ Trade. Trade Test (Skill Test): Trade Test (Skill Test) for technical & tradesmen personnel including Clerk & Personal Assistant will be conducted before undergoing Detailed Medical Examination (DME). No marks will be awarded. Candidates will be assessed as Pass or Fail. Candidates who pass the trade test will only be undergoing for Detailed Medical Examination (DME). Detailed Medical Examination (DME) and Review Medical Examination (RME): Detailed Medical Examination (DME) and Review Medical Examination (RME) will be undergone as per guidelines issued by ADG (Medical) CAPF, NSG & AR dated 20 May 2015. 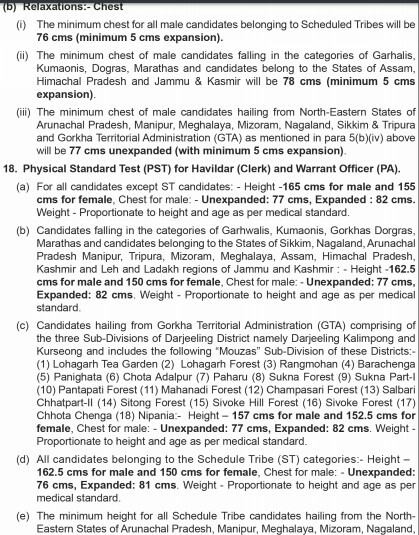 The candidates who qualify in all respects i.e Physical Standard Test (PST), Physical Efficiency Test (PET), Written Examination, Trade Test (Skill Test) and Medical Examination Test will be placed in Merit List depending upon the trade and category wise vacancies allocated to States / UTs. Instructions to join the Training Centre for enrolment will be issued on the basis of Merit List. Please note that merely qualifying in all tests does not guarantee the Final Selection into the Assam Rifles. 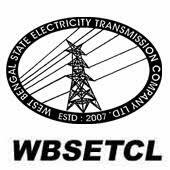 The Final Selection will only be made on the basis of position of the candidates in Merit List in accordance with the availability of vacancies in the respective State / Category / Trade. The Exam pattern of Assam Rifles Technical and Tradesmen Exam has clearly mentioned on our website. Assam Rifles Technical and Tradesmen Questions paper will contain questions from their respective branch and will also include some questions of General Aptitude and Reasoning, General English, Numerical Aptitude and General Knowledge.